In need of some inspiration for your lounge? Then take a look through our living room decorating ideas. We have plenty of hints and tips on how to decorate your living area. Whether you are overhauling your entire room or just looking to make a few small changes, you will find the inspiration you need to give your living room that much needed update. 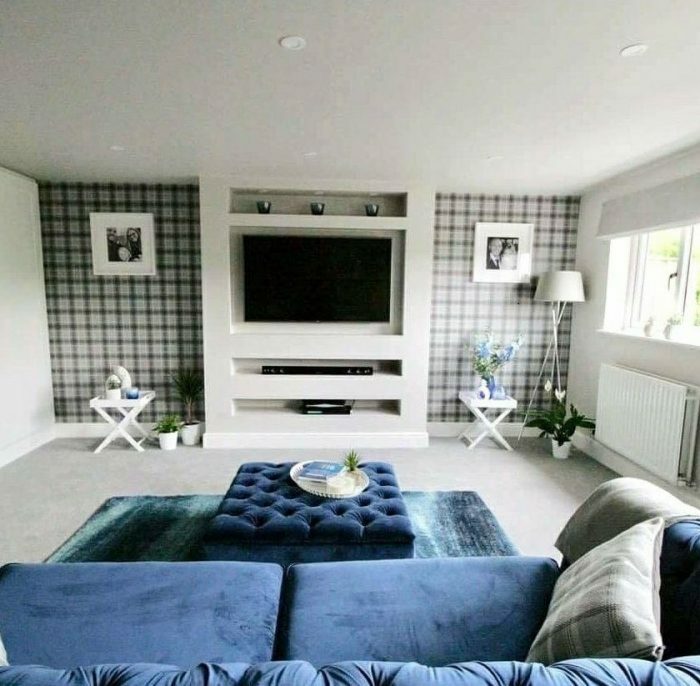 A feature wall is the perfect way to add some style to your living room walls. 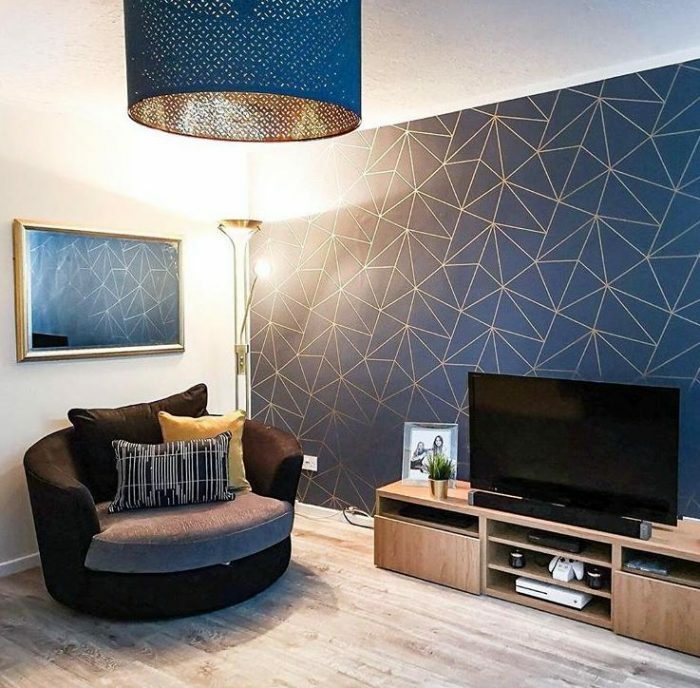 If you have a small lounge but fear a bold patterned wallpaper will overpower the room, consider a feature wall. 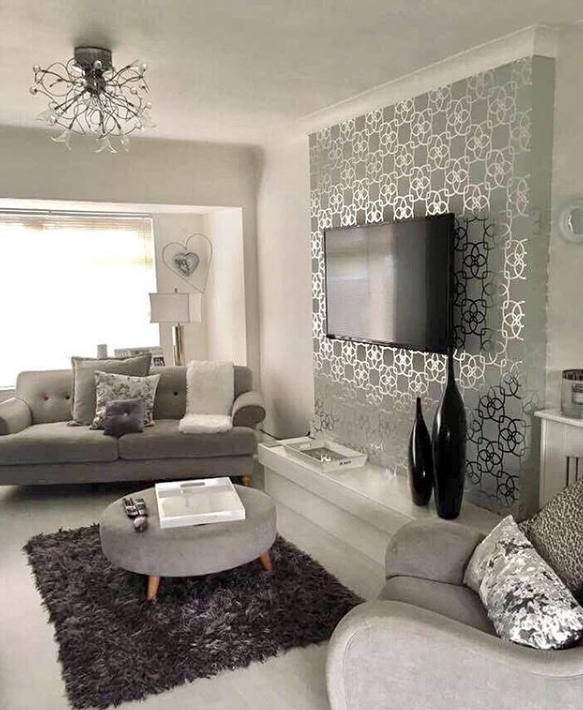 The chimney breast is the perfect place for feature wallpaper, whether its a floral pattern you’re after or perhaps you are wanting to add some stripes to your living room. Make sure your other walls are painted in a complimenting colour and you are good to go. Two colours which were big in 2018 were grey and rose gold. These two complimenting tones were a hit in many homes last year and is a trend that is here to stay. If you are considering a living room update, why not try this colour combination? 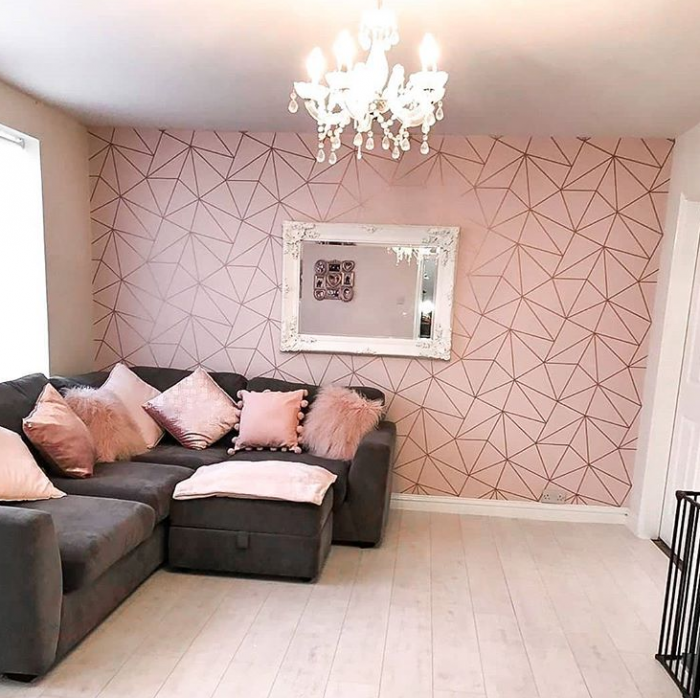 Start with some grey and rose gold wallpaper in a subtle yet stylish print, then furnish the room with some beautiful soft blush and cream furniture. Accessorise with some rose gold light fittings and dark grey accessories and your room is complete. The geometric print was another big hit for 2018 and is set to be a continuing trend for 2019 too. This beautiful print is one that looks stunning in a living room and allows you to experiment with print in a sophisticated way. 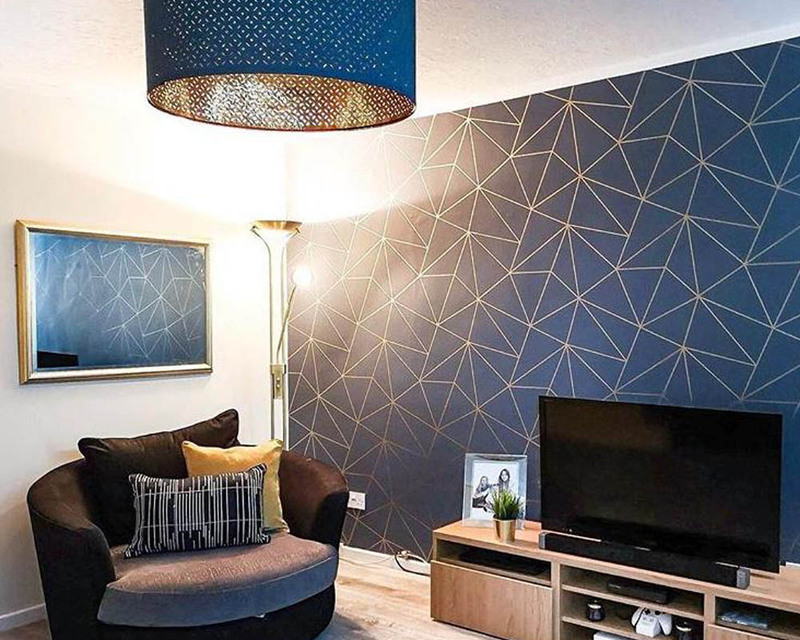 No matter what colour scheme you choose for your lounge, a little geometric wallpaper is the perfect way to decorate your walls. The navy and gold is a particular favourite of ours, as is the soft pink and rose gold print, both of which will help to create a beautiful living space. You may think white is a little dull and boring, but think again. A white patterned wallpaper is the perfect way to add subtle style to your walls. Plus, if you are short on space in your living room, then this particular shade will help to create the illusion of extra space. From brick effect to trellis print, white pattern wallpaper is ideal for those who want to keep things looking clean and chic yet still want to add a little something extra to their decor. 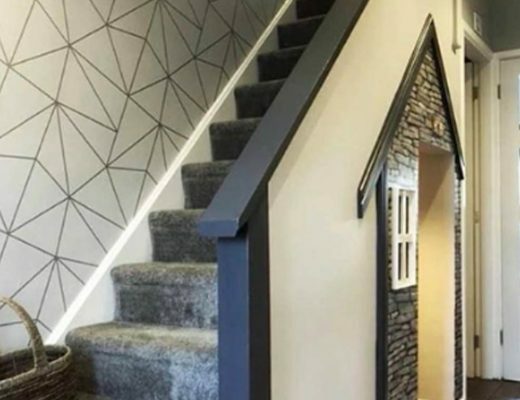 One of our favourite living room decorating ideas is wallpapering the alcoves. 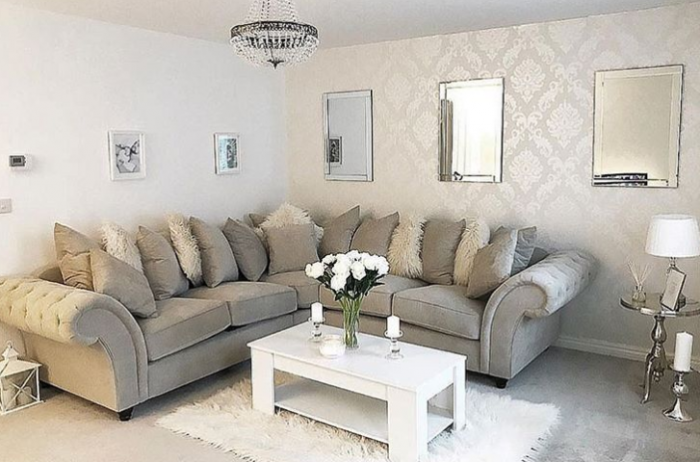 More often than not, the alcoves in a living room are overlooked when it comes to decorating, but a great way to update your living room is by wallpapering your alcove walls. Opt for a contrasting colour to the rest of your room for a unique yet on trend look. Damask wallpaper is a superb look for alcoves, as is trellis print, tartan and marble effect too. The colour of the year for 2019 is ‘Living Coral’ and if past years are anything to go by, then this particular shade is set to be everywhere over the next twelve months. 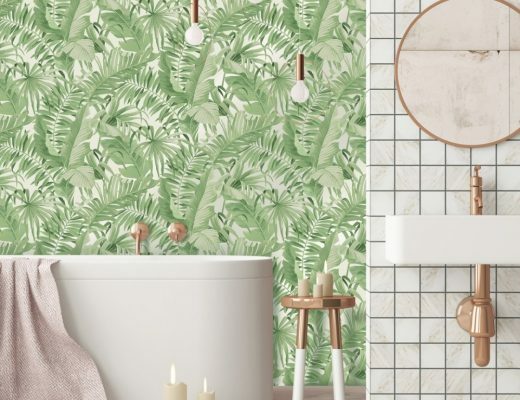 Expect a lot of coral when it comes to decor trends in 2019 and if you are wanting to add the trend to your home this year, then why not add it to your living room? Turquoise, white and grey all compliment coral beautifully, so bear this colour palette in mind when decorating your lounge. Some subtle grey wallpaper paired with coral and turquoise homeware is the perfect way to add the colour of the year to your home in 2019. Need some more living room decorating ideas for your home? Below are a few more handy hints on how to update your lounge in the new year. When it comes to flooring, you don’t need to keep replacing it everytime you want to redecorate. Instead, opt for a versatile laminate or some wooden flooring and use large area rugs in the middle of your room. This way you won’t need to replace your flooring each time you want to change the colour scheme of your living room. Instead, simply add a new rug whenever you feel like updating your lounge. Don’t forget the ceiling. It’s easy to just leave the ceiling as it is, but why not utilise this space when updating your living room? Try painting your ceiling a different colour besides white or add some prints to give your room a more opulent feel. You could even try some different lighting such as built in down lights for a unique touch. Want to mix it up a bit? Then combine different patterns and textures to create a luxurious living room that wouldn’t look out of place in a show home. Think geometric rugs, fluffy blankets and velvet cushions for a lounge that will be the envy of your friends and family. 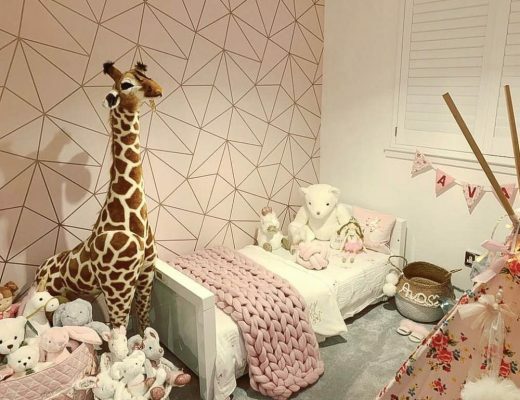 For more living room decorating ideas and home decor tips, keep checking back for more blog posts or scroll through the I Love Wallpaper Instagram where you will find plenty of inspiration for every room of your abode.